Reproducable and identical development environment for all host operating systems with zero configuration requirements. 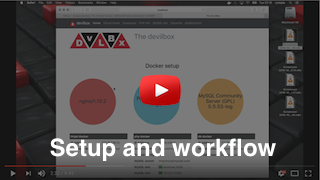 The Devilbox is a modern and highly customisable dockerized PHP stack supporting full LAMP and MEAN and running on all major platforms. The main goal is to easily switch and combine any version required for local development. It supports an unlimited number of projects for which vhosts, SSL certificates and DNS records are created automatically. Email catch-all and popular development tools will be at your service as well. Configuration is not necessary, as everything is already pre-setup. Don't worry about switching computers. The devilbox will run on all major operating systems. Your whole development stack is up and running in a few simple steps. Choose your required daemons and select a version. Any combination is possible. This will allow you, to always exactly simulate your production environment locally during development. You are not forced to load the whole stack everytime. Only bring up what you really need. Head over to youtube for a quick introduction and see for yourself how easily new projects can be created. The built-in postfix mailserver is configured to automatically intercept all outgoing emails. This is an important measurement during development to make sure not to accidentally send out real emails. Instead you will be able to see all sent emails in the included intranet mail view. See Intranet section below. Creating a new project just requires you to create a new folder on the filesystem. As you probalby don't want to bother with editing your /etc/hosts file everytime, the built-in DNS server will automatically provide the correct DNS records for every project. No need to download external tools. Everything is bundled, up-to-date and available inside the containers. There is nothing special about the devilbox, so any framework or CMS that will work with normal LAMP/MEAN stacks will work here as well. However in order to make double sure, a few popular applications have been explicitly tested. Find documentation and help here. Once the devilbox is up and running, you can visit the bundled intranet on http://localhost. Be aware that the docker service is running with root privileges on your system (like any other webserver for example). The devilbox is using a mix of official docker images and custom images. All integrated containers are available on Github and can be reviewed at any time. Docker containers are pushed to Docker Hub frequently. It should be enough for you to pull updated images on a regeular basis. However, if a new minor version (PHP for example) has just been released and you want to use it right away, you can simply *git clone* the docker repository and rebuild the container. Each container repository contains a shell script for easy building. 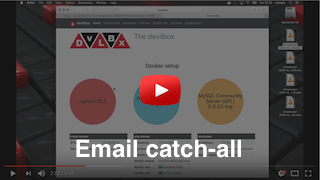 In order to make sure everything always runs stable and as expected, the devilbox makes heavy use of integration tests. You can head over to Travis-CI and have a look at stable and nightly builds. Contributers are welcome in any way. First of all, if you like the project, please do star it. Starring is an important measurement to see the number of active users and better allows me to organize my time and effort I can put into this project. You can also get actively involved. Do clone the project and start improving whatever you think is useful. There is quite a lot todo and planned. If you like to contribute, view CONTRIBUTING.md and ROADMAP. Major contributors will be credited within the intranet and on the github page.